Moore picked up a battered acoustic guitar at the age of ten. He started performing at a young age, making his live debut in a school band, during the intermission of one of his father's promoted shows. He got his first quality guitar (a Fender Telecaster) at the age of 14, and learned to play the right-handed instrument in the standard way, despite being left-handed. In 1968, after performing with a number of Belfast-based bands, Gary Moore, at the age of 16, was "headhunted" as the replacement guitarist in the Dublin-based band Skid Row and he moved to Dublin. Moore's greatest influence in the early days was English guitarist Peter Green of Fleetwood Mac who was a mentor to Moore when performing in Dublin. Other early musical influences were artists such as Albert King, Elvis Presley, The Shadows, Buddy Guy and The Beatles. Later, having seen Jimi Hendrix, Roy Buchanan and John Mayall's Bluesbreakers in his home town of Belfast, his own style was developing into a blues-rock sound that would be the dominant form of his career in music. After joining the group Skid Row with Noel Bridgeman and Brendan "Brush" Shiels, in mid 1968, cutting a number of singles and an album, released in 1970, Skid Row then went on to play shows across Europe and the US, opening for a number of high-profile bands. It was with this group that Gary Moore earned a reputation in the music industry, and his association with Phil Lynott began. Moore left the band in December 1971. In 1970, Moore moved to England and remained there, apart from two short periods in the United States. In 1973, under the name "The Gary Moore Band", he released his first solo album, Grinding Stone. Grinding Stone was issued in North America on Neil Kempfer-Stocker's fledgling record label imprint Cosmos and received "Album of the Year" accolades on KTAC-FM/Seattle-Tacoma, Washington, in 1974. From 1975 to August 1978, he was a member of Colosseum II. With that band, he also collaborated with Andrew Lloyd Webber on the composer's Variations album in 1978. Between late 1977 and early 1978 while moving from Colosseum II and a future return to the ranks of Thin Lizzy, Gary Moore recorded the album Back on the Streets, featuring the hit single "Parisienne Walkways" which reached the Top Ten in the UK Singles Chart in April 1979. While Back on the Streets was climbing the charts, Gary Moore had joined Thin Lizzy on a more permanent basis. Recording the album Black Rose: A Rock Legend, which reached number two in the UK album chart. Moore appears in the videos for "Waiting for an Alibi", "With Love" and "Do Anything You Want To". In July 1979, he left Thin Lizzy permanently to focus on a possible solo career, but went on to form the short lived band G-Force recording an album for Jet Records. A couple of other albums were made at this time, but not released until after Moore had signed to, and found some success with Virgin Records in 1982, and had released the album Corridors of Power. During the 1980s, Moore released several heavy metal records as a solo artist, beginning with Corridors of Power in 1982, which were followed by Dirty Fingers and Victims of the Future the following year. Dirty Fingers had been recorded already in 1981, and with an entirely different band. It represents Moore's last attempt at finding somebody to sing his songs; he would sing on all later solo records. The two remaining albums are notable for featuring ex-Deep Purple drummer Ian Paice, and Victims of the Future was the first album to feature Neil Carter, who would become a permanent fixture in Moore's bands in the years to come. These albums are Moore's most unrelenting, uncompromising heavy metal albums. In later years they were largely disowned by Moore himself, but remain fan favourites; Moore's influence as a rock guitarists is also primarily based around these albums, which are more guitar-heavy than his later material. These albums are in particular noteworthy for their descriptions of the feelings of dread and anxiety for youth growing up during the Cold War. Songs with anti-militaristic themes, which either implored the ceasing of war or depicted its horrors, would become a staple on almost every album from this period of Moore's career. Moore continued in a slightly more commercial direction with the album Run for Cover, which was released in 1985. This album is notable for being the final cooperation between Moore and Phil Lynott – front man and bassist in Thin Lizzy, who would die the following year – as well as being the final album to feature him that was released in Phil's lifetime. The album's first single, Out in the Fields, was a major hit in England and Scandinavia a minor hit in Germany and the Netherlands, and would set the stage for Moore's greatest commercial successes later towards the end of the decade. The ballad "Empty Rooms", which earlier had appeared in a less polished version on the Victims of the Future album, became a particular fan favorite, and it was the track from this era of his career that Moore later appears to have been most fond of. Moore's 1987 album Wild Frontier launched him as a super-star through much of Europe. The album saw Moore return to a Celtic-flavoured brand of heavy metal exhibited in his earlier Thin Lizzy material, but with a new social conscience, as material dealt with The Troubles and questions of belonging in the face of hardships and death (one track was dedicated to the late Phil Lynott). Both the album and its first single, "Over the Hills and Far Away", topped the charts in Norway and Finland, and the album did tremendously well throughout Western Europe, but failed to make much of an impact in the United States, where Moore's heavy metal albums were never well distributed. The two follow-up singles, "Wild Frontier" and "Friday on my Mind" (a revamped cover of the classic Easybeats song), also did well. The following album, After the War, was generally well received, and truly broke Moore into the German market, but has often come to be seen as a slightly weaker album, and did not do as well as his previous offering. Moore is often considered to be one of the most impressive live artists of the era, and he capitalized on this by releasing several concerts either on record or video. His 1985 live album We Want Moore! is in particular regarded as a classic of the genre, as is the 1987 video Live at Isstadion Stockholm from the Wild Frontier tour. Prior to the recording of Corridors of Power, Moore had joined Greg Lake to help finish the recording of his first solo record Greg Lake after the demise of Emerson, Lake and Palmer. Moore toured with the Greg Lake band and recorded a second Greg Lake solo record, but didn't tour it. Following the lukewarm reception of After the War, Moore decided to make a blues album. Released in March 1990, Still Got the Blues, with contributions from Albert King, Albert Collins, and George Harrison, saw Gary Moore returning to the musical form that had inspired him in his early days in Belfast. The album was well received by fans and was certified Gold in the U.S; it was thus the first of Moore's albums to truly expand into the US market. Seeing the success of this album, Moore decided to restart his career around what was originally conceived as a one-off stylistic departure. Peter Green's continued influence on Moore was repaid as a tribute to Green on his 1995 album Blues for Greeny, an album consisting entirely of Green compositions. On this tribute album, Moore played Green's 1959 Les Paul Standard guitar that Green had lent to Moore after leaving Fleetwood Mac. Moore ultimately purchased the guitar, at Green's request, so that "it would have a good home". Throughout his career, Moore experimented with many musical genres, including rock, jazz, blues, country, electric blues, hard rock, and heavy metal. In 1987, he performed a guitar solo for a cover of the Beatles' "Let It Be", which was released under the group-name of Ferry Aid. The record raised substantial funds for the survivors of the MS Herald of Free Enterprise disaster. In 1990, he played the lead guitar solo on "She's My Baby" from Traveling Wilburys Vol. 3. Moore stayed with the blues format until 1997. He returned to rock, but with a softer, more pop and ballad-oriented sound on Dark Days in Paradise, followed with another change of direction in 1999, when he decided to experiment with modern dance beats on A Different Beat; this left many fans, as well as the music press, confused. In 2001 with Back to the Blues, Moore returned to his tried and tested blues format: he continued with this style on Power of the Blues (2004), Old New Ballads Blues (2006), Close As You Get (2007), and Bad For You Baby (2008). In January 2005, Moore joined the One World Project, which recorded a song for the 2004 Indian Ocean tsunami relief effort. The group featured Russell Watson, Boy George, Steve Winwood, Barry Gibb, Brian Wilson, Cliff Richard, Dewey Bunnell, Gerry Beckley, and Robin Gibb on vocals (in their order of appearance), and featured a guitar solo by Moore. The song, entitled "Grief Never Grows Old", was released in February 2005, reaching No. 4 on the UK Singles Chart. He also took part in a comedy skit on French and Saunders entitled "The Easy Guitar Book Sketch" with comedian Rowland Rivron and fellow musicians Mark Knopfler, Lemmy from Motörhead, Mark King from Level 42, and David Gilmour from Pink Floyd. During a relationship in the late 60s while he was with Skid Row, his eldest daughter, Saoirse was born. He was married from 1985 to 1993 and had two sons, Jack and Gus. Since 1997, he was living with his partner, an artist named Jo, and their daughter Lily (b. 1998). At the time of his death, he lived in Vallance Gardens, Hove, East Sussex. According to The Daily Telegraph, Moore's fatal heart attack was possibly brought on by the amount of alcohol he had consumed on the evening of his death. Moore had 380 mg of alcohol per decilitre (100 millilitres) of blood (0.38%) in his system. Blood alcohol content from 0.40% to 0.50% is considered to be lethal. Gary Moore's eldest son Jack, alongside his uncle Cliff Moore, performed the traditional song "Danny Boy" at his father's funeral. This was reported in the Belfast Telegraph as a flawless tribute at which some mourners in the church wept openly. He was laid to rest in a private ceremony at St Margaret's Churchyard, Rottingdean, East Sussex, England, with only family and close friends in attendance. Moore was very popular in Western Europe, Scandinavia, Eastern Europe and Japan, but less successful in the US. Throughout his career, Moore was recognised as an influence by many notable guitarists including Martin Barre, Vivian Campbell, Patrick Rondat, John Norum, Paul Gilbert, Gus G, Slash, Orianthi, Joe Bonamassa, Adrian Smith, Phil Collen, George Lynch, Doug Aldrich, Jake E. Lee, Zakk Wylde, Randy Rhoads, John Sykes, Henrik Freischlader, Janick Gers, Kirk Hammett, It is notable that whilst Gary found his greatest commercial success as a blues player, his albums from the heavy metal years seem to have had the larger musical influence. Jack Moore performed a tribute on his guitar, that had belonged to his father, alongside Danny Young in the form of a music video around the anniversary of his father's birthday, in April 2017. The song was named "Phoenix", which was written and performed by both Jack Moore and Danny Young. Moore was associated with many guitar brands over his career, but the guitar he was most associated with was the Gibson Les Paul. Moore's 1959 Les Paul Standard guitar was famed for its distinctive out-of-phase sound attributed to a possible pickup repair, in which the magnet in the neck pickup had been flipped, causing the out-of-phase sound when combined with the bridge pickup. The guitar was originally owned by Peter Green. Green sold the guitar to his younger friend Moore in 1974 for the price that Moore got from selling a Gibson SG, his main guitar at that time. Moore used the guitar extensively over the next 30-plus years, on hits such as "Parisienne Walkways", which was his best-known song. The guitar is now owned by Metallica guitarist Kirk Hammett who purchased the guitar, a number of years after Moore had sold it, for an undisclosed amount. Another guitar Moore was associated with was a red 1961 Fender Stratocaster, which Moore had purchased in 1981. The guitar was almost sold to Greg Lake, ex of Emerson, Lake and Palmer,[better source needed] who was originally viewing the guitar, but Moore had tried it out and liked the sound of the guitar acoustically. Lake passed on the guitar as it was not in pristine condition, and so Moore made a deal. The Red Strat, also known as the Pink Strat, was extensively used by Moore on Corridors of Power along with many other recording sessions, over the years. The Red Strat was seen on many live performances, most notably at the Fender 50th Anniversary show held at Wembley Arena, North London, in 2004 when Moore performed Jimi Hendrix's song "Red House". The neck pickup was rewound by pickup maker Seymour Duncan in 1998. Fender Guitars launched a custom shop tribute replica of the Red Strat, in 2016, which was undertaken by Fender master builder John Cruz. ^ "Moore's almanac." Belfast Telegraph, 24 May 2007. Retrieved 7 February 2011. ^ Ling, Dave (July 2006). "Gimme More". Classic Rock. No. 94. p. 64. ^ "Former Thin Lizzy guitarist Gary Moore was five times drink drive limit when he died". The Telegraph. 27 February 2012. ^ "Blood Alcohol Concentration". Clemson University. 30 June 2015. Archived from the original on 2 July 2015. Retrieved 2 July 2015. 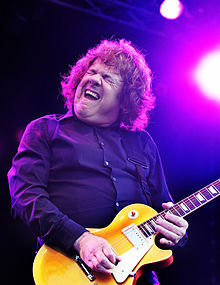 ^ "Thin Lizzy guitar hero Gary Moore laid to rest as son plays Danny Boy – BelfastTelegraph.co.uk". BelfastTelegraph.co.uk. Retrieved 22 May 2017. ^ "Vivian Campbell Interview : Guitar Interviews". GuitarInternational.com. Archived from the original on 6 January 2011. Retrieved 5 April 2011. ^ Bosso, Joe (15 August 2007). "The Man, The Myth, The Metal: Gibson Interviews Zakk Wylde". Gibson Lifestyle. Archived from the original on 2 December 2008. Retrieved 8 February 2011. ^ "blabbermouth.net – Ozzy Osbourne on Gary Moore: 'We've Lost A Phenomenal Musician And A Great Friend'". Roadrunnerrecords.com. Archived from the original on 14 February 2011. Retrieved 5 April 2011. ^ "Rest in Peace Gary Moore :Doug Aldrich.com News". Dougaldrich.com. 13 February 2011. Archived from the original on 29 September 2011. Retrieved 6 July 2011. ^ "Classic Rock » Blog Archive » Gary Moore: Ozzy, Roger Taylor Pay Tribute". Classicrockmagazine.com. Archived from the original on 15 April 2011. Retrieved 5 April 2011. ^ "Musicians Pay Tribute to Gary Moore, Former Thin Lizzy Guitarist Found Dead in Spanish Hotel". Sky News. Archived from the original on 10 February 2011. Retrieved 5 April 2011. ^ "Sitio Oficial de Ignacio Garay". Ignaciogaray.com.ar. Archived from the original on 6 July 2011. Retrieved 5 April 2011. ^ "OPETH Mainman: 'We Are Devastated To Hear About The Passing Of GARY MOORE'". Blabbermouth.net. 6 February 2011. Retrieved 5 July 2017. ^ "Whelan's » Blog Archive » GIG FOR GARY". Whelanslive.com. 18 March 2011. Archived from the original on 16 April 2011. Retrieved 5 April 2011. ^ "Gary Moore's Son Plays His Father's Gibson Guitar in New Tribute Video". Guitar World. 21 April 2017. Retrieved 22 May 2017. ^ GuitarPlayer.com, Electric & Acoustic Guitar Gear, Lessons, News, Blogs, Video, Tabs & Chords -. "Gary Moore's Son Plays His Father's Gibson Guitar in New Tribute Video". Retrieved 22 May 2017. ^ "Jack Moore". www.facebook.com. Retrieved 22 May 2017. ^ GuitarPlayer.com, Electric & Acoustic Guitar Gear, Lessons, News, Blogs, Video, Tabs & Chords –. "Kirk Hammett Talks About His Prize: Peter Green and Gary Moore's Les Paul—See It In Action". Retrieved 9 July 2017. ^ "Kirk Hammett: "Jimmy Page Told Me to Buy Peter Green's Les Paul"". Guitar World. 20 April 2017. Retrieved 9 July 2017. ^ "PressReader.com – Connecting People Through News". www.pressreader.com. Retrieved 9 July 2017. ^ Instruments, Fender® Musical. "Limited Edition Gary Moore Stratocaster® | Artist Series | Fender® Custom Shop". www.fendercustomshop.com. Retrieved 9 July 2017. ^ "Under the microscope: Gary Moore's Fiesta Red Fender Stratocaster". MusicRadar. Retrieved 9 July 2017. ^ "Gary Moore – Red House". YouTube. Retrieved 9 July 2017.